Little did I ever expect these would be the circumstances in which I would return to the church alone. It was poignant in another way also: that May concert marked the start of my friendship with Mandy and Nick. It sealed my resolve to go to Darsham that morning. Now it seemed more important than ever to have a solitary experience of the church before I attempted to play in Mandy’s memory in front of a church full of people. I stayed at the church longer than I intended, not only playing but sitting, thinking of Mandy and of the John Clare poem her sister was going to read at her funeral. They had chosen it together for a beloved aunt’s funeral just a couple of months earlier. I couldn’t believe I had never come across it before, so perfectly did it describe my own feelings about nature. Eventually I stirred myself, as I wanted to visit another church and time was getting short. Nick had recommended Blaxhall to me, and it lay conveniently on my route to Woodbridge where I had to pick up some hedging plants on my way home. 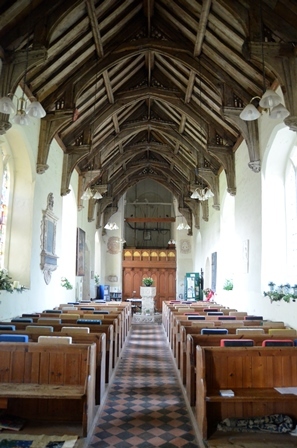 His attachment to the church stemmed from the years that he and Mandy owned a little cottage in the village. The book they had lent me, Ask the fellows who cut the hay, was also based around Blaxhall. I’d been reminded of this only a few hours before when I’d picked up the book during a wakeful hour in the night. I found Blaxhall church on a quiet lane. 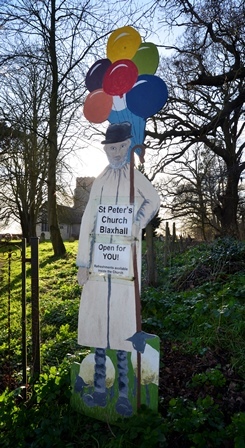 Before I even got out of the car I could tell there was something special about it: beside the church gate was a life-size shepherd painted onto a board with a bunch of balloons attached to his crook, and the words: ‘St Peter’s church, Blaxhall. Open for YOU. Refreshments available inside the church’. I am always happy to know that a church is open before I get to the door, but this welcome was different. 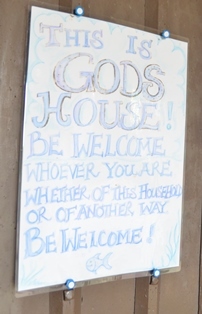 On the open door to the church was another welcome sign, and inside was a little fridge with milk in it, and beside it, mugs, tea, coffee, sugar, squash and a box of biscuits. 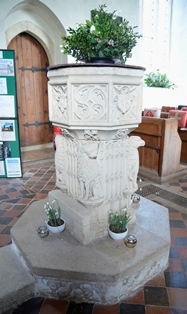 The font was decorated with little pots of snowdrops, and turning towards the chancel was a colourful display of kneelers. 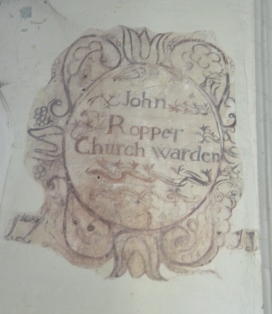 On the west wall was a lovely detail: in 1711 a churchwarden called John Ropper was commemorated with a painted plaque to the left of the tower. 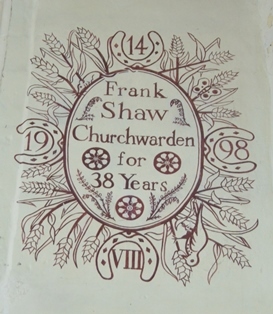 On the right was a slightly different design to commemorate another churchwarden, Frank Shaw, in 1998. I am sure that my practice at Blaxhall was pleasant; how could it be otherwise in such surroundings? But I remember little about it. Everything else I am unlikely ever to forget, especially Mabel, Bonny and Mara, the Wensleydale sheep who graze the churchyard – even though I didn’t meet them. 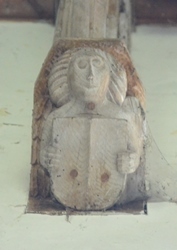 In the porch was a wonderful display of information about churchyard flowers, a survey of swifts in Suffolk, and the benefit of sheep grazing for keeping old gravestones accessible to visitors and encouraging wild flowers. 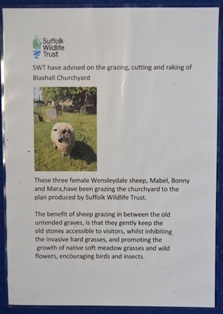 I was pleased to discover sheep in Middleton churchyard for exactly these reasons. 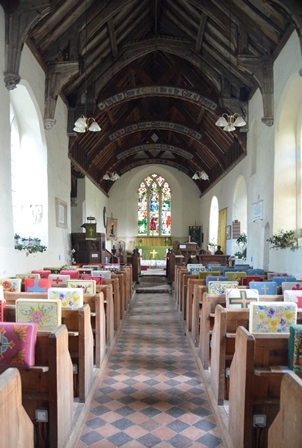 Perhaps the idea was not new after all, but it would be wonderful if more Suffolk churches adopted it. I had been smiling since I first saw the church sign, and by the time I sat down to play I was in no doubt that Blaxhall would win the prize for most welcoming church so far. 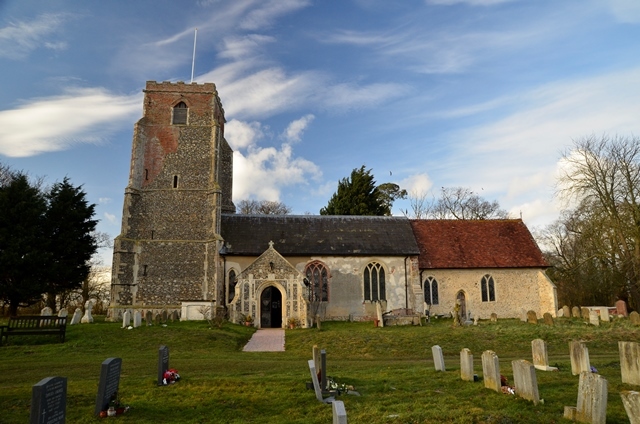 It is hard to fathom, coming across a church like this on a quiet country lane, why any rural church in Suffolk should have an excuse for remaining locked.